Its not just the health promoting benefits which make this a pricey fruit. It is also its tart and tangy smell with underlying sweetness that add to its value. 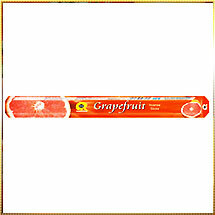 We have compressed its smell in our range of Grapefruit Incense Stick which infuses mind to some another divine world. And if any case, this is your favorite fruit, you can savor its taste all the time with our range of eco-friendly Incense Stick releasing less fume. This Grapefruit Incense Stick glorifies our Fruity Series collection of incense featuring less fume, stimulating fragrance, and fine texture. Attractive and well-sealed packaging is assured to retain its quality.